Round Five of the AFLG competition in Germany featured everything from hidings to heart stoppers. But, by the end of the weekend, the Frankfurt Redbacks had possibly made the greatest move, finding themselves a game clear inside the top four. Their win at home against the Württemberg Giants has seen them clear away from the Rheinland Lions. They will need to keep winning, however, to keep the Lions at bay as they have a poor percentage. 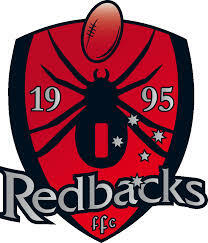 In their other match of the Frankfurt fixture, the Redbacks went down to the Hamburg Dockers by 57 points. To complete tri-match weekend, the Dockers were merciless against the Giants, romping away to a huge 122-point win. The closest match of the round was in Munich. Finals hopefuls, the Munich Kangaroos and Berlin Crocs, clashed in essence for the title of favourite to meet the rampaging Dockers on grand final day. The result saw the Kangaroos hold on in a thriller by just four points to grab second place on the ladder. Munich were too good for the Rheinland Lions in their other match with an impressive eleven goal victory. The Lions’ weekend was made tougher when they went down to the Berlin Crocs by 23 points. By the end of the round, the Hamburg Dockers had secured top spot, undefeated after six matches. The Munich Kangaroos sit a game behind in second place and the Berlin Crocs a further game behind in third. The Frankfurt Redbacks are in the top four. Sitting outside four are the Rheinland Lions and Württemberg Giants with the Dresden Wolves sitting in last place. Round Five sees just three matches in three cities. Arguably the match of the round, the Dockers host the Crocs in Hamburg. The Frankfurt Redbacks will host the Munich Kangaroos and in Dresden the Wolves have a big shot at their first win of the season when the host the Rheinland Lions.